This is an 18th century antique map by Henri Abraham Chatelain. 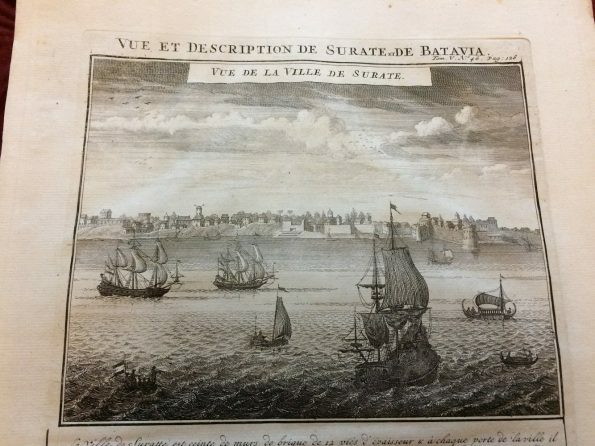 The title of the map is Vue et Description de Surate et de Batavia. The map illustrates beautifully the town of Surat in the northwest coast India. It shows a harbour town with ornate 18th century ships. 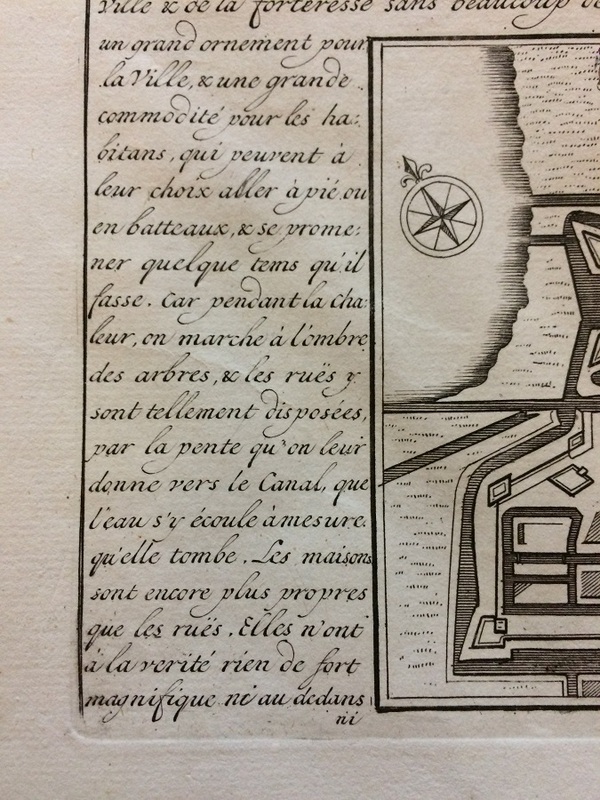 It says Vue De La Ville De Surate. On the top right it is written ‘Tom V No 46. Pag : 128’ which I believe the catalogue number of the map. I think it means from the Fifth Volume Number 46 Page 128. Below the Surate picture there are descriptions of the town – I think of being a trade port with other countries. 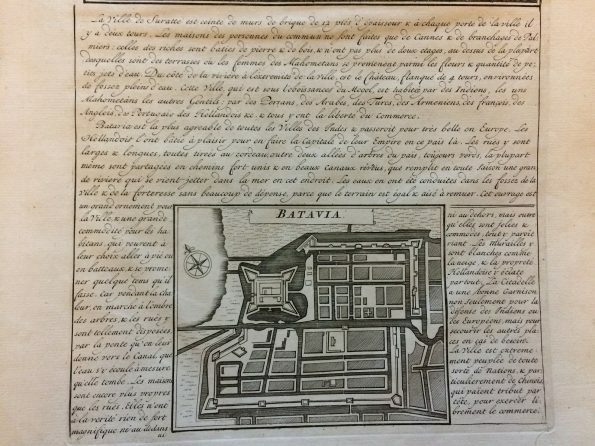 And there are descriptions as well to the plan of Batavia. Batavia is a present capital of Indonesia, which is now called Jakarta. You can see the map of what would be the city of Batavia. 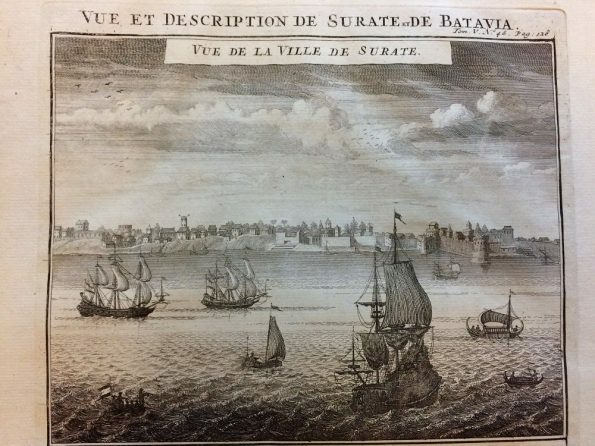 Not sure what is the connection between Surat and Batavia so that Henri Abraham Chatelain put them together in one map. Perhaps there was a port route between Surat and Batavia? Or a trade route between them? Or Henri Chatelain just made them in one map to show the flourishing ports in Asia in the 18th century? What does it say about Batavia? Or I think Henri Chatelain may say that Surat and Batavia are the examples of trading port between Asia and Europe. Some kind of a gateway to Asia from Europe. 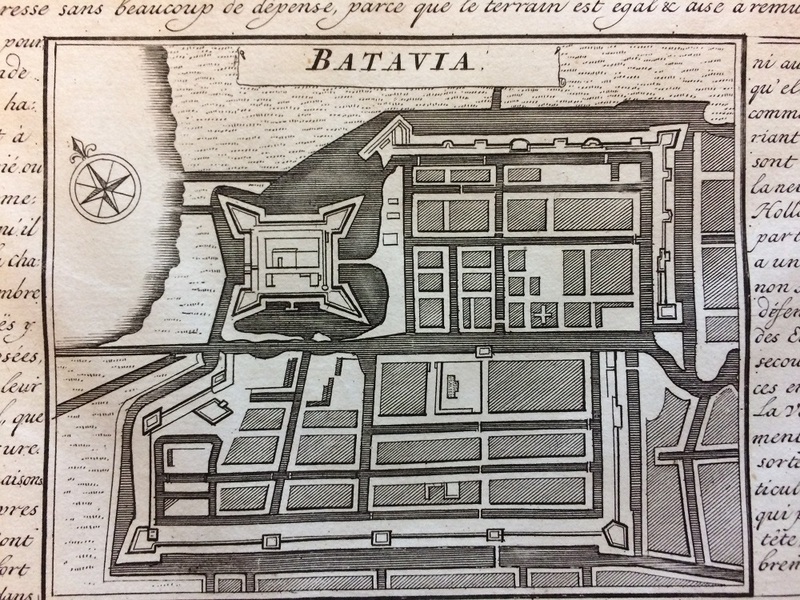 By the 18th century I believe Batavia was occupied by the Dutch. But I am not sure about Surat. 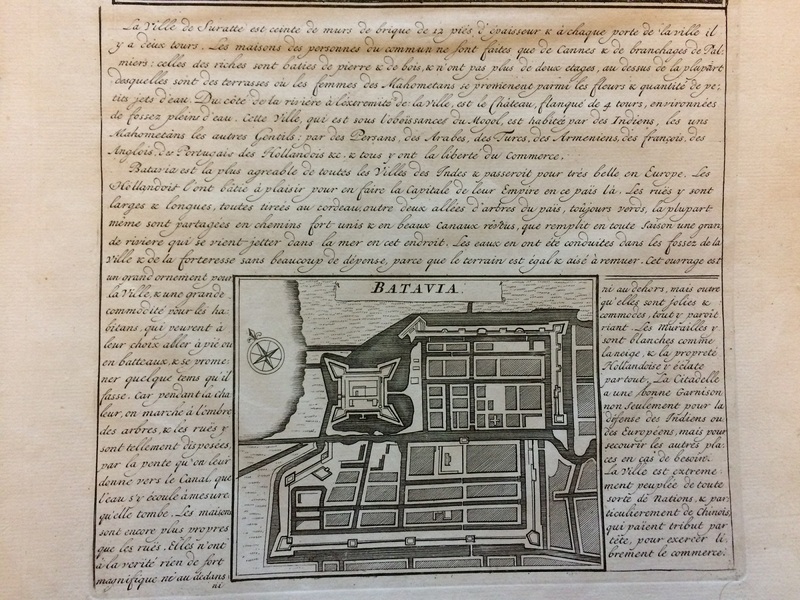 The map was made in 1719. It is I believe part of Volume V of Atlas Historique. Atlas Historique is an extensive Dutch encyclopedia published in seven volumes. 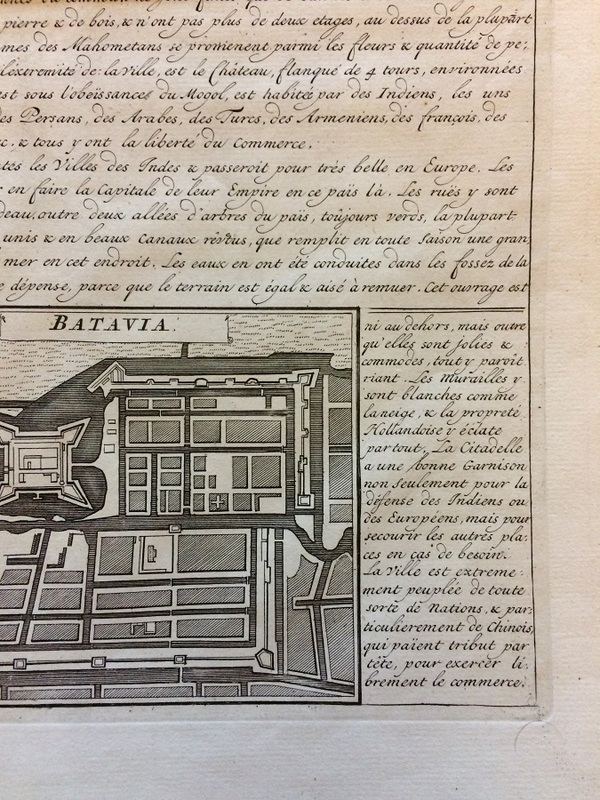 The Atlas Historique was published between 1705 to 1720 as first edition. 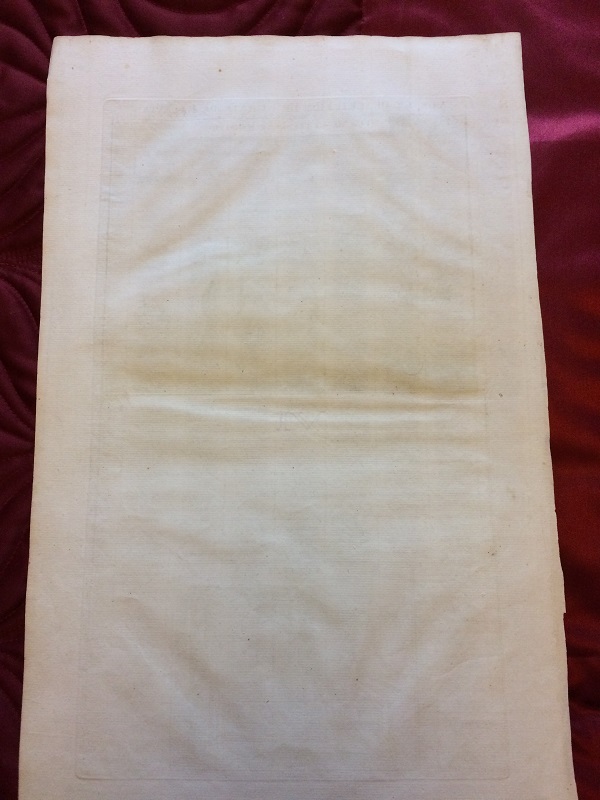 The second edition appears in circa 1732. Although it is written in French, I think it is a Dutch map because it is published in Amsterdam. I hope the map is the first edition – although I am not sure how rare it is or how many originals had been printed back then. The map, I believe, is originally uncoloured. Though I am not sure if Henri also published this Vue et Description de Surate et de Batavia in originally coloured version. 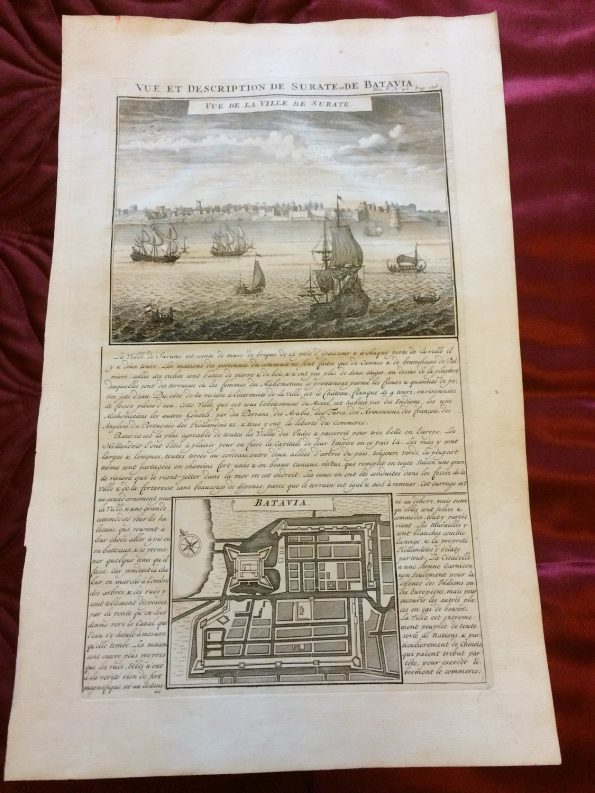 I am very new of antique map collecting, but does the first edition is more sought compared to later edition? I read that sometimes later edition with more corrections and additions to the map is more sought? Is this true? How about the colouring of antique map? Does it make any difference in term of value? Which map is sought after: originally coloured or originally uncoloured? Any idea would be much appreciated. Now back to the author, Henri Abraham Chatelain is a Frenchman with Parisian origin. 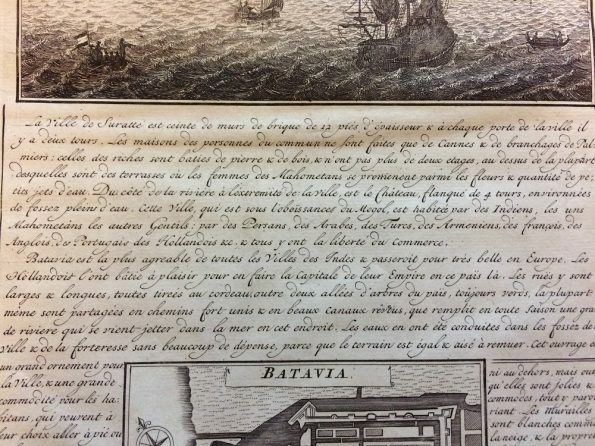 He, his father Zacharie Chatelain, and his brother Zacharie Junior, worked to published the Atlas Historique. They worked as partnership and have several publishing firms: Chatelain, Chatelain Frères and Chatelain & Fils, among which together with l’Honoré published the Atlas Historique.